As the skies darken earlier each day, the airs gets colder, and we get back into ritualistic mode of welcoming death and all of its tenets, it’s only fitting we delve into music that welcomes this annual embrace of all things evil and horrible. Ghosts, skeletons, and devils will be everywhere, and as I’ve said before, if you really sit and think about it, these are pretty sick things to be welcoming. But we do it nonetheless, and this generally is the time of the year when my listening rotation gets much darker and grimier, because I tend to choose my music by the seasons. It is also fitting that we are going to immerse ourselves in “Gratum Inferno,” the debut album from Dallas’ Cleric, a charred, burning, evil platter that’s so good and so infernal, I feel it’s my responsibility to recommend it to as many people as I can. And so here we are, doing just that. Release by Tofu Carnage (a label we’ll be drawing on far more going forward), this seven-track, nearly 30-minute platter of pure death metal might win the record for most references to Satan in such a short time period. It could be a great drinking game. Every time you hear Satan’s name hissed back at you, take a drink. You’re dead by the end of the record. That’s not to make fun of the matters at hand here. Death metal also has a purely evil past and always dwelled on the darkest, most heinous elements when it was forming as a genre, and Cleric take us back to that time. 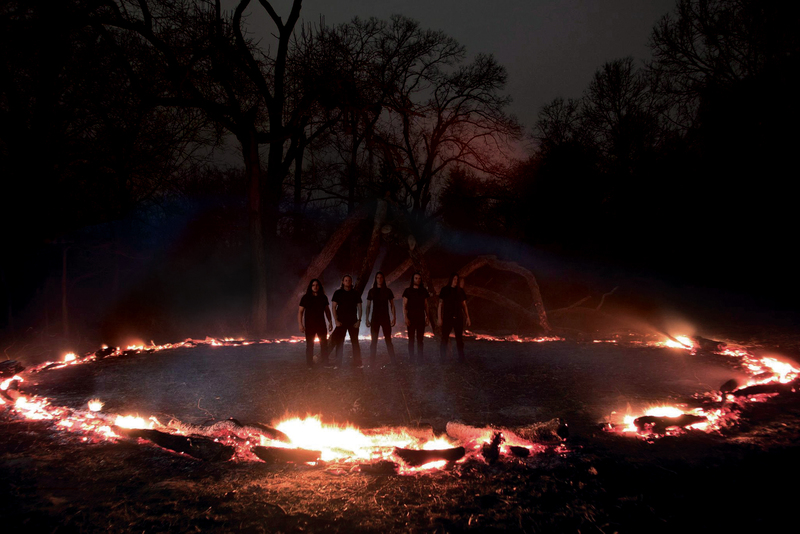 Their music is gritty, suffocating, and burnt in a large sacrificial pit, and they’re already making for great company as Halloween rolls around and the symbols of pure evil and death are all around us. I can’t think of a better time to absorb Cleric than late at night, when witching hours nears and strange things lurk (or at least our imagination tells us this), although I’ve gotten just as much enjoyment out of this record in broad daylight. Although we’re finally getting Cleric’s debut now, they’ve actually been kicking around, off and on, for more than half a decade. The band formed in 2007, issuing contributions to a split effort with Pools a year later, and then the group split another year after that, with everyone going their separate ways. The band then reformed in 2011 for a festival, and the machine got its wheels rolling properly after that, leading us to where we are now. Cleric’s members have experience with various other bands, including Kill the Client and the tremendously named Tyrannosorceress, and the current lineup includes vocalist Zac Christian (who jumped on board in 2011), guitarists Chris Richardson and Andrew Hawkins, bassist John Schiller, and drummer Zack Jobin. So we’re still kind of at the beginning of Cleric, and that’s a really good thing. The title track opens the record with a weird orchestral bit that feels more creepy than classy, and then it erupts into a full-on death assault, boiling and blasting its way along, with burly riffs and strong soloing and vocals that sound like they’re being delivered from hell. “Through the Starless Abyss” is ugly and grinding, and we get one of those aforementioned calls to Satan, with gurgly vocals, dizzying riffs, and enough violence to make you fall over with the room spinning. “From Womb to Tomb” chugs along mightily, with the drums thrashing and mauling your senses, and Christian howling about “Satan’s hunger.” Did I mention they reference Satan a whole bunch of this record? Uh, speaking of which, the next cut “Satanic Dimension” starts with a nasty death groove, as filthy vocals declare, “You will know your one true master,” and the band eventually kicks into a meaty, bloody start/stop rhythm that is pure brutality. “Into Death and Far Beyond” starts with foggy ’80s-style sci-fi synth, like something you’d hear smeared over a film “Mystery Science Theater 3000” would send up, which is a compliment, by the way. The song then gets horrifyingly thrashy, clobbering everything in its way, yet a sense of melody is beneath, giving the song a catchy vibe even as Christian is pleasing for the dark lord to “destroy the essence of creation.” “Left Hand Wrath,” probably the most creative title on the record, also begins with a weird keyboard display, but then guitars start to whinny out of control, gravelly vocals begin to do heavy damage, and warped guitar parts leave you both enthralled and a little nauseated. Closer “Faith in Debauchery” injects machine-like noises into the song, sounding like a car with a bad engine racing out of control, but the song itself goes slower than those sounds might indicate. It takes its time to settle into a proper rhythm, with guitars charged up, a haunting ambiance taking over the atmosphere, and the song going out on a note that’s practically liturgical, with a chorus carrying out the record to its resting place deep underground. It may have taken Cleric a little while and a few hiccups along their bloody path to get this album into circulation, but it was worth the wait. This a really good band with a keen eye on death metal’s ranks, where surely they see groups they can devour and dominate in order to prove their superiority. “Gratum Inferno” is a vicious punch to metal’s throat and should only get more deviously effective as each day’s light disappears earlier every day.